The sub-order Scombroidei is usually referred to as tuna and tuna-like species (Klawe, 1977; Collette and Nauen, 1983; Nakamura, 1985). It is composed of tunas (sometimes referred to as true tunas), billfishes and other tuna-like species. They include some of the largest and fastest fishes in the sea. The tunas (Thunnini) include the most economically important species referred to as principal market tunas because of their global economic importance and their intensive international trade for canning and sashimi (raw fish regarded as delicacy in Japan and increasingly, in several other countries). In fact, the anatomy of some tuna species seems to have been purpose-designed for canning and loining. Tunas are sub-classified into four genera (Thunnus, Euthynnus, Katsuwonus, Auxis and Allothunnus) with fifteen species all together. From the genus Thunnus, the principal market tunas are albacore (T. alalunga ), bigeye tuna (T.obesus ), Atlantic bluefin tuna (T. thynnus), Pacific bluefin tuna (T . orientalis) southern bluefin tuna (T.maccoyii) and yellowfin tuna (T.albacares ). Skipjack tuna (Katsuwonus pelamis) is the seventh principal market tuna species. Their superbly efficient metabolic system includes a circulatory system that allows them to retain or dissipate heat as required for peak biological performance and efficiency. They are all oceanic (FigureC1.1), capable of long migrations or movements, constituting one or two stocks in each ocean. The exceptions are Atlantic and Pacific bluefins, which do not occur only in their eponymous oceans. Southern bluefin constitutes a single stock extending in the Atlantic, Indian and Pacific Oceans. Because of the economic situation in Japan in recent years, prices of bluefin tuna, the species most valued for sashimi, although still high compared to other species, have decreased somehow. For a whole fish, fisherman may get between US$30 and US$40 per kg with some getting closer to US$100. Not long ago, a fish of exceptional quality reached US$500 per kg and more recently even more, but such prices referring to very few single fish do not reflect the situation with the market. Bigeye are also well priced on the sashimi markets. Although yellowfin are also very popular on these markets, the prices they bring are much lower. For canning, albacore fetch the best prices due to their white meat, followed by yellowfin and skipjack for which fishermen are paid much less than US$1 per kg. The relatively low prices of canning-quality fish are compensated by their very large catches, especially in the case of skipjack and yellowfin. Longtail tuna (T.tonggol) is becoming increasingly important for canning and the subject of substantial international trade. The consumption of tuna and tuna-like species in forms other than canned products and sashimi is increasing. The tunas other than the principal market species are more neritic (living in water masses over the continental shelf). They include longtail tuna, blackfin tuna (T. atlanticus ), black skipjack (E.lineatus ), kawakawa (E. affinis ), little tunny (E. alleteratus ), bullet tuna (A. rochei) and frigate tuna (A. thazard ). The billfishes (Istiophoridae) are composed of marlins (Makaira spp. ), sailfish (Istiophorus spp. ), spearfish (Tetrapturus spp.) and swordfish (Xiphias gladius, only species in the genus). With the exception of two species (Mediterranean and roundscale spearfish), all billfishes have very wide geographical distributions, but not all species occur in all oceans. Billfishes are mostly caught by longlines as by-catch except swordfish which are targeted in certain regions using also longlines and harpoons. Billfishes are also taken in sport fisheries, where they are greatly valued. They are all excellent seafood. Other important tuna-like species include slender tuna (Allothunnus fallai ), butterfly kingfish (Gasterochisma melampus ), wahoo (Acanthocybium solandri ), bonitos (Cybiosarda, Orcynopsis and Sarda ), Spanish and king mackerels, seerfishand sierra (Scomberomorus spp.). Other important tuna-like species represent a significant potential especially for developing countries where mostly artisanal and recreational fisheries are now catching them. Slender tuna and butterfly kingfish (with a circumpolar distribution in the Southern Ocean) are now caught mostly as by-catch of the Japanese longline fishery targeting southern bluefin tuna. The 1982 UN Convention on the Law of the Sea classifies the principal market tunas, billfishes, blackfin tuna, bullet and frigate tuna, little tunny and kawakawa as highly migratory even though little tunny and kawakawa are mostly confined to the continental shelf and upper slope. Black skipjack is not classified as highly migratory, but it is probably more oceanic than little tunny and kawakawa. Further information on some global aspect of tunas and tuna-like species can be found in Allen (2002) and Joseph (1998, 2000, 2003). Information references at regional scale are given in the respective resources status sections. Since the nineteenth century (and even from more ancient times), traditional tuna fishing has been carried out in various parts in the world. Those fisheries were local and generally near the coasts. In the Atlantic, they included purse seining for bluefin tuna off Norway, trolling for albacore in the Bay of Biscay, trap fishing near the Strait of Gibraltar and North African coast, swordfish fishing in the northwestern Atlantic and in the Mediterranean, bigeye and skipjack fishing near islands and artisanal fishing along the African coasts. In the Pacific, various artisanal fisheries operated near islands in the tropical waters (albacore trolling off west coast of US, baitboat fishing for yellowfin and skipjack off the coast of US, pole and line fishing for skipjack near Japan and many other fisheries for various tunas along Japanese coasts). Off South America, coastal fisheries operated using baitboats and small seines. In the Indian Ocean, skipjack fishing off Sri Lanka, India, and Maldives was carried out. Off Australia, longline fishing was carried out for southern bluefin tuna. Many other artisanal fisheries for tuna-like fishes existed in tropical or subtropical areas all over the world. As the results of increasing demand for canned tuna, industrialized fisheries started during the 1940s and 1950s. They included Japanese longline and baitboat fishing in the Pacific and US baitboat fishing off California along the Mexican coasts, while the traditional fisheries continued. After the World War II, the fishing areas for the Japanese tuna fishery were limited to its coast until 1952. However, since then, the fishery, particularly the longline ones, expanded the fishing area very rapidly. In late 1950s, its fishing areas reached even to the Atlantic Ocean. Also in the late 1950s, some European pole and line fishing started off the African coasts from local harbours. In the 1960s, Spanish and French boats with pole and line and purse seines started tuna fishing off west Africa. Also, Japanese longliners expanded their fishing area all over the world, mostly fishing albacore and yellowfin for canning. In the middle of the 1960s, Korea and Taiwan Province of China started large-scale longline fishing to export tuna for canning, learning the techniques from Japan. At the end of this decade, the Japanese longline industry developed an extremely cold storage system used for new frozen products for the sashimi market. Consequently, Japan switched the target species from yellowfin and albacore to bluefin and bigeye. US pole and line fishing off Central and South America were almost completely replaced by purse seiners in the 1960s. Also, the purse seining of tuna with dolphin was developed. In the 1970s, purse seine fisheries of European countries developed quickly in the east tropical Atlantic and attained the first peak of their catches of yellowfin and skipjack. Also, the purse seine fishery developed further in the east tropical Pacific. A strict regulation for the reduction of mortality of dolphins caught with tuna fishing was implemented in this area. Consequently, the US flag vessels started changing the flags to other central and South American countries. 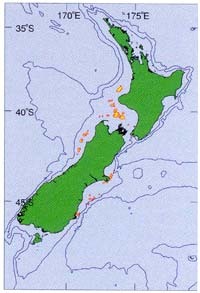 Also, some fishing effort was shifted to the central and western Pacific where no dolphin fishing occurred. Since the development of extremely cold storage, some longliners gradually changed target from yellowfin (for canning) to bigeye (for sashimi). This shift was first seen among Japanese longliners, but it gradually expanded to the fleets from Korea and Taiwan Province of China. To catch bigeye, whose habitat is much deeper than that of tropical tunas, long lines were set deeper and deeper. This change in fishing strategy implies changes in fishing areas, leading to modifications in target and by-catch species. In the 1980s, new purse seine fishery started in the western Indian Ocean; many French seiners from the eastern Atlantic moved to the Indian Ocean. In the Pacific Ocean, the purse seine fishery expanded its fishing area, particularly in the south, central and western Pacific. Purse seine fishing efficiency increased with modern equipment such as bird radar and the use of helicopters. During the 1990s, many new countries entered into large-scale industrial fishing, mostly purse seining (e.g., Mexico, Venezuela and Brazil). Small-scale longline fishing operations by coastal countries in various areas (e.g., Mediterranean countries, Philippines and Indonesia) also started. The Japanese longline fleet started to reduce its size in the 1980s. At the same time, Taiwan Province of China longliners and others flying flags of convenience increased rapidly. Particularly in the 1980s, management regulatory measures for tuna fisheries were introduced by tuna fishery bodies, which also affected fishing patterns and country shares of catches. In the 1990s, more management measures were introduced, this resulted in an increase in illegal, unreported and unregulated (IUU) fishing. IUU fishing became a large hazard for proper management of fish resources. In general, the tuna fishing capacity extensively increased during the 1990s. Recent increases in the catches sometimes caused over-supply to the market, particularly for skipjack because of large purse seine catches. Starting in the 1980s and increasingly in the 1990s, many coastal states started new tuna fishing by chartering boats of flag of convenience. This occured in all oceans. Some of these chartered vessels changed flags to the coastal states and possibly this tendency will be intensified in the near future. Partially due to the development of these new coastal fisheries, the fishing effort by traditional longline countries started to decline. Purse seiners started fishing around Fish Aggregating Devices (FADs) in the Atlantic in the early 1990s, and this method expanded to the Indian and Pacific Oceans. The FAD fishing is less selective for fish species and size. The fishing efficiency, size of fish taken, species composition and incidental catch changed drastically with the adoption of this new practice. Table C1.1: Industrial tuna fisheries operating entirely or partially on the high seas. Tuna farming started in the 1990s. This new industry resulted in a better price being paid to the fishermen and an increasing demand for specific sizes and species. Through farming/fattening process, the relatively small tunas taken by purse seiners which used to be sold only for canning can now be used for the sashimi market. Until now, bluefin tuna is the main species used in farming, but farming is extending to bigeye and yellowfin tuna. Bluefin farming is expanding, now including Australia, Japan, Mexico and several Mediterranean countries (particularly Croatia, Italy, Malta, Morocco, Spain and Turkey). Presently, on the industrial scale, tuna and tuna-like species are mainly caught with purse-seine, longline and pole-and-line over wide areas in oceans (FigureC1.1, and Carocci and Majkowski 1996, 1998, 2001). Other gears used are troll lines, handlines, driftnets, traps and harpoons. The industrial tuna fisheries are very dynamic and fleets, especially distant-water fishing fleets, can react very quickly to changes in stock size or market conditions. For example, in the early 1980s, many French and Spanish purse seiners from the Atlantic moved to the Indian Ocean, contributing to the doubling of the Indian Ocean catches in the 1980s. Some of these vessels have now moved back to the Atlantic. Similarly, US purse seiners moved from the eastern Pacific to the western part of the Ocean. The purse seine and pole-and-line are used to catch fish found close to the surface (e.g. skipjack and relatively small individuals of yellowfin, albacore and bluefin). Longlines are used for fish found at greater depths (e.g. large individuals of bluefin, bigeye, yellowfin, albacore and billfishes). Most purse seine and pole-and-line catches are canned. Longline catches with the exception of those of albacore are mainly sold on the sashimi market to be consumed raw, traditionally in Japan, but now also in several other countries. The use of pole-and-line and large-scale longlining has been generally declining, while purse seining is increasingly used, resulting in increased catches of skipjack, small to medium yellowfin and small bigeye, while catches of large yellowfin and the other principal market tunas have remained relatively stable. Information on industrial tuna fisheries entirely or partially on the high seas is summarized in Table C1.1. Small-scale longlining for high-quality fish for the sashimi market is increasingly being used by Taiwan Province of China and mainland China as well as other developing countries. This contributes to a general trend of rapidly increasing importance of developing coastal countries (including island countries of the Indian and Pacific Oceans) in tuna fishing. This increasing importance of developing countries results from the purchase of purse seiners and from the intensification of artisanal fisheries. Catches from these fisheries may still be underestimated despite the fact that the rate of non-reporting of catches in developing countries is being reduced. Further information on tuna fisheries can be found in Miyake, P.M., Miyabe, N. and Nakano, H. (in prep.). Similarly to most sections of this volume, catch profiles in this section are based on FAO catch statistics. Tuna fishery bodies, international technical programmes, and tuna fishing countries may have more accurate and/or up-to-date statistics. Home pages of several of theses bodies and programmes are listed in the Resource Status section below. These statistics have also been collated by FAO on the global scale and they are available from the FAO web page. 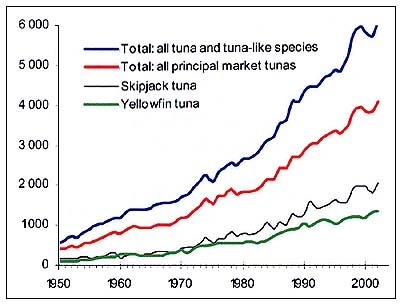 The global production of the principal market tunas increased relatively steadily from less than 0.5 million tonnes in the early 1950s to the peak of 4.1 million tonnes in 2002 (FigureC1.2). Between 1970 and 1978, the catches of principal market tunas increased significantly as a result of the expansion of fisheries in the eastern Atlantic and the development of new offshore fishing grounds in the eastern Pacific. Between 1978 and 1984, many vessels moved to the western Pacific and the western Indian Ocean, developing new fisheries there. Tuna catches are unlikely to continue to grow, having been relatively stable since 1998 (FigureC1.2). They may even decline, if the management of tuna fisheries is not successful. Skipjack, which is used mostly for canning, account for the greatest proportion of the world catches of tuna (FigureC1.2). Its catches tended to increase over the entire period of its exploitation. In 2002, the skipjack catch was about 2.0 million tonnes (the highest on record), representing about half of all principal market tuna landed, almost entirely for canning. In the early 1980s, catches of skipjack increased steadily as a result of expansion of fishing effort into the tropical western and central Pacific and into the western Indian Ocean. Yellowfin is commercially the second most important species of tuna by volume. Catches increased until the early 1990s. Since then, they have remained relatively stable at around 1 million tonnes. In 2002, the catch reached about 1.3 million tonnes (Figure C1.2). Most yellowfin are used for canning, but more and more of the catches are being sold in fresh fish markets (also some as frozen fish). Catches in the Atlantic (Table D17) shown little change over the last two decades, and fluctuated between 129 000t and 156 000t in 1995 to 2002. Catches from the Indian Ocean increased to the maximum of over 300 000t in 1993 due to increased fishing effort, fluctuating between 245000 and 300 000t in 1995 to 2002. Catches of yellowfin from the Pacific, like those of skipjack, increased consistently until 1976, when they stabilized. They did not begin to rise again until the early 1980s, when large fleets of purse-seine vessels began to fish in the tropical western and central Pacific. Between 1996 and 2002, catches increased from 597 000t to 906 000t. Bigeye, the third most important species in terms of landed volume (Figure C1.3) is similar in appearance to yellowfin. However, unlike yellowfin, bigeye tuna are primarily creatures of the deep, spending most of their lives in cold waters below the upper mixed layer of the ocean where they were traditionally captured mainly by longline gear. Their high fat content (for insulation from the cold water) make them desired for the Japanese sashimi market. The rapid and substantial increase in catches in the mid 1970s resulted from modifications of longline gear which enabled it to be used in much deeper water than previously. However, more recently the longline catches of large bigeye have been declining, while purse-seine catches of smaller bigeye have been rapidly increasing, resulting in continuous large increases of total catches for the species to the peak of 431 000t in 2000. World production of albacore, used mostly for canning, increased from 1950 to the late 1960s. It has fluctuated without a clear trend since with catches of 238 000t in 2002. (Figure C1.3). During the 1980s and early 1990s, driftnet fisheries made large catches of small albacore on the high seas in the south-western and north-eastern Pacific. With the termination of these fisheries, the total albacore catch in the Pacific declined. Atlantic, Pacific and southern bluefin contribute relatively little in terms of volume to the total catches of principal market tunas (Figure C1.3), but their individual value is high due to their use for sashimi. 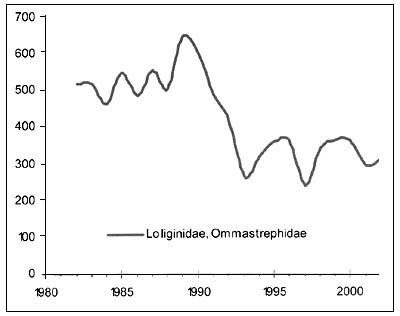 Catches of Atlantic bluefin followed a generally declining trend from the early 1950s to the early 1970s. During the next decade and half, catches fluctuated without trend. In the early 1990s, catches increased rapidly to 53 000t in 1996 due to improved reporting in the Mediterranean Sea. Catches declined after 1996 and they have stabilized at 36 000t in 2000–2002. The catch of Pacific bluefin peaked at 32 000t in 1961. The smallest catch was 6 000t in the early 1990's. Catches have fluctuated upwards since, being in the order of 17000 in 1999–2000, but decreasing to 9 000t in 2001–2002. 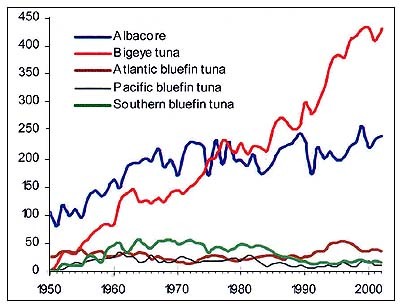 Catches of southern bluefin increased steeply from 14 000t in 1952 to 53 000t in 1961. They fluctuated without trend between 40 000t and 55 000t until 1974. Catches decreased steeply and steadily from 47 000t in 1980to 12 000t in 1991. They have remained between 11 000t and 17 600t since, with 15 000t reported in 2002. The catches of tunas and tuna-like species other than the principal market tunas also significantly increased from about 0.5 million tonnes in the early 1970s to nearly 2.0 million tonnes in 2002 (see Table D17). Only less than 10 percent of them are composed of billfishes, taken mainly in the Pacific and Atlantic. In terms of volume, the most important species of tunas and tuna-like species other than the principal market tunas (i.e., small tunas and tuna-like species) are: Japanese Spanish mackerel, frigate and bullet tuna, kawakawa, narrow-barred Spanish mackerel, swordfish, longtail tuna, Indo-Pacific king mackerel, seerfishes, Atlantic bonito, Indo-Pacific blue marlin, Eastern Pacific bonito, Indo-Pacific sailfish, king mackerel, striped marlin and Atlantic Spanish mackerel. Historically, the largest proportion (Table D17) of principal market tunas has been always taken from the Pacific (FigureC1.1). Between 1998 and 2002, the annual catch of these species in that Ocean remained quite stable at about 2.5 million tonnes. This represents approximately 65 percent of global annual catch of principal market tunas. Skipjack and yellowfin contribute about 85 percent of the total catch of principal market tunas in the Pacific. Till the mid 1980s, catches of principal market species in the Atlantic and the Mediterranean Sea were greater than those in the Indian Ocean. About at that time, they become smaller than those in the Indian Ocean. During the last decade, catches of principal market tunas in the Atlantic remained stable, with an average of 0.5 million tonnes annually, representing almost 15 percent of global landings of principal market tunas. In 2002, Atlantic landings were 429 000t. Bigeye, skipjack and yellowfin contribute about 80 percent of the total catches of principal market species there. Prior to the 1980s, the catch from the Indian Ocean accounted for less than 8 percent of world production of principal market tunas. Due to the expansion of tuna fishing operations in that Ocean, catches of skipjack and yellowfin increased rapidly in the 1980s. Consequently, catches of principal market tunas in the Indian Ocean surpassed those in the Atlantic Ocean, accounting for about 20 percent of global landings of principal market tunas in 2002 (i.e., around 964 000t). Presently, skipjack and yellowfin contribute about 83 percent of the total catches of principal market tunas from the Indian Ocean. Principal market tuna catches of Japan and Taiwan Province of China are presently largest (more than 0.5 and 0.4 million tonnes caught in 2002, respectively) among those of all countries. Traditional tuna fishing countries include also Spain (277 453t in 2002), Republic of Korea (257 570t in 2002), USA (154 153t in 2002) and France (161 230t in 2002). In addition, recent catches of Indonesia (406 175t in 2002), the Philippines (211 964t in 2002), Ecuador (135 362t in 2002), Mexico (160 151t in 2002), Venezuela (135 956t in 2002) exceeded those of some traditional tuna fishing countries, reflecting a general trend of increasing importance of non-traditional tuna fishing countries (mostly developing countries). Particularly off Southeast Asia, in both the Indian and Pacific Oceans, tuna fisheries are growing, including the artisanal sector catching mostly small tunas, skipjack and yellowfin. This sector's growth has been also significant in the entire Indian Ocean. Other important countries catching principle market tunas include: Maldives (137 050t in 2002), Papua New Guinea (121 579t in 2002), Ghana (61 279t in 2002) and Sri Lanka (61 183t in 2002). Summary on the status of various stocks of tuna and tuna-like species is given in Table D17. This information is taken from publications available just before the preparation of this review and from web pages of, mainly, the Commission for the Conservation of Southern Bluefin Tuna (CCSBT, http://www.ccsbt.org/); the Inter-American Tropical Tuna Commission (IATTC, http://www.iattc.org/); the International Commission for the Conservation of Atlantic Tunas (ICCAT, http://www. iccat.es/); the Indian Ocean Tuna Commission (IOTC, http://www. iotc.org/) and the Secretariat of the Pacific Community (SPC, http://www.spc.org.nc/). The knowledge and data on the principal market tunas is generally much better than for other species of tuna and tuna-like species. They have been studied for many years and more research effort is devoted to them. However, even for these species, significant uncertainties exist in the basic biological knowledge and data. For example, recent research indicates that the life span of southern bluefin tuna, one of the best studied tuna, may be considerably longer than previously believed. For Atlantic bluefin tuna, another well-studied species, officially reported catches may be significantly smaller than those actually taken, according to information from a trade-based statistical programme (Miyake, 1998) recently introduced by ICCAT. When considering the information on the stock status, uncertainties in stock assessment need to be taken into account. Most tropical principal market tunas have reacted well to exploitation due to their very high fecundity, wide geographical distribution, opportunistic behaviour and other populations dynamics that make them highly productive. With proper management, they are capable of sustaining high yields. The possibilities of overexploitation and stock depletion should not be underestimated, however. In the western and central Pacific, there is still a potential for significant increases in catches of skipjack. Higher catches of skipjack might be sustained also in the eastern Pacific and possibly, also in the Indian Ocean, but this is uncertain. Concerns is also increasing over the overexploitation of bigeye, another species highly desired for sashimi, which is tropical and has a life span shorter than bluefin. In addition to possibly causing over-fishing, the increasing purse seine catches of small bigeye may negatively affect the longline catches of large bigeye, which has much higher prices. The remaining stocks of tropical principal market species are close to being fully exploited. Already the temperate species of bluefin, most desired for sashimi, are overexploited, if not depleted. The Western Atlantic bluefin stock is depleted as is the southern bluefin. The yield-per-recruit of Pacific bluefin could be increased if catches of small bluefin taken by trolling and purse seining are reduced. The stocks of temperate species of albacore used mostly for canning are moderately exploited in the South Atlantic and the South Pacific, fully to overexploited in the North Pacific and overexploited in the North Atlantic. The status of albacore in the Mediterranean Sea and in the Indian Ocean is unknown. The status of many other tuna and tuna-like species is highly uncertain or simply unknown especially in the Pacific. Therefore, the intensification of their exploitation raises concerns. Significant uncertainties in the status of many billfishes represent a serious conservation problem. In the Atlantic, they seem to be overexploited. Because of commercial exploitation, there is more known about swordfish than other billfishes, particularly in the Atlantic and the Mediterranean Sea where the stock are either fully or overexploited and in the Mediterranean Sea where the stock seems to be fully exploited. There are concerns also about the intensification of fisheries targeting swordfish in the Indian Ocean. States fishing tuna and tuna-like species cooperate regarding conservation and fisheries management within several international frameworks (FAO, 1994; Marashi, 1996; Beckett 1998), particularly: (1) the recently created Commission for the Conservation and Management of Highly Migratory Fish Stocks in the Western and Central Pacific Ocean; (2) the Commission for the Conservation of Southern Bluefin Tuna (CCSBT); (3) the Inter-American Tropical Tuna Commission (IATTC) for the eastern Pacific; (4) the Indian Ocean Tuna Commission (IOTC); and (5) the International Commission for the Conservation of Atlantic Tuna (ICCAT). IATTC is the oldest tuna fishery body established in 1950, while IOTC is the youngest, operational since 1998. In addition to their responsibilities in conservation and fisheries management, CCSBT, IATTC, ICCAT and IOTC facilitate the data collection, collation, processing and dissemination, stock assessment, other research and their co-ordination for their areas of competence and some of them, also in adjacent waters to which the stocks extend from their area of competence. IATTC carries out intensive research, having significant research capacity, while the role of CCSBT, ICCAT and IOTC in research is mostly limited to the co-ordination of activities of their member countries. Some countries fishing tuna in the Mediterranean Sea (which is included in the area of competence of ICCAT) are not members of ICCAT, but of the General Fisheries Commission for the Mediterranean (GFCM). Therefore, ICCAT closely collaborates with GFCM regarding tuna and tuna-like species. IOTC and GFCM are fishery bodies of the Food and Agriculture Organization (FAO) of the United Nations. Before the creation of IOTC, the FAO/UNDP Indo-Pacific Tuna Programme (IPTP) co-ordinated and carried out tuna research in the Indian Ocean and the Pacific off Southeast Asia. Before its termination, it transferred the responsibility for the data collation, processing and dissemination for tuna and tuna-like species in the Pacific off Southeast Asia to the Southeast Asian Fishery Development Center (SEAFDEC). The Secretariat to the South Pacific Community (SPC), having a significant research capacity, fulfils technical functions similar to the tuna fishery bodies, but its responsibilities do not extend to fisheries management. The recently created Commission for the Conservation and Management of Highly Migratory Fish Stocks in the Western and Central Pacific Ocean will fulfil that responsibility. The Forum Fisheries Agency (FFA, http://www.ffa.int/) is involved in negotiating and regulating access of distant water tuna vessels to its area of competence in the South Pacific. However, contrary to fishery bodies, its membership does not include non-coastal states. Cooperation must also extend beyond the scale of single oceans. Industrial tuna fleets are highly mobile and the principal market tunas are intensively traded on the global scale. In addition, many tuna research, conservation and management problems are similar in all oceans. Therefore, there is a need for exchange of information and collaboration on the global scale regarding fisheries for tunas and other spieces with wide global distribution. An important example of such a collaboration is the formulation, in 1995, of the Agreement for the Implementation of the Provisions of the UN Convention on the Law of the Sea of 10December 1982 relating to the Conservation and Management of Straddling Fish Stocks and Highly Migratory Fish Stocks (sometimes referred as the Fish Stocks Agreement). The United Nations facilitated the conclusion of this Agreement and FAO actively assisted, from the technical point of view, in reaching the Agreement (Doulman, 1995). In December 11, 2001, the above-mentioned 1995 Agreement entered into force, becoming a new legal basis for conservation and fisheries management of tuna and tuna-like species (supplementing the UN Convention on the Law of the Sea of 10 December 1982). In 1995, the Code of Conduct for Responsible Fisheries was completed within the framework of FAO (FAO, 1995). Though not legally binding, the Code provides a norm for all fisheries and related activities. The Agreement and the Code pose new requirements for conservation, fisheries management, technology and research regarding tuna and tuna-like species, which are likely to affect various sectors of the tuna industry (Mahon, 1996). As a result, the high seas will no longer be perceived as areas where unrestricted fishing is allowed. The precautionary approach incorporated into the Fish Stocks Agreement and in the Code may affect the exploitation of tuna and tuna-like species. It calls on states to be more cautious where information is uncertain, unreliable or inadequate (FAO, 1996; Majkowski, 1998). Adequate information is available for most stocks of principal market tunas to determine whether they are fully exploited or overexploited. However, for many other tuna and tuna-like species, this is not the case. Within the context of the precautionary approach, the absence of adequate scientific information should not be used as a reason for postponing of failing to take conservation of fisheries management measures. In March 2000, FAO co-organized, jointly with CCSBT, IATTC, ICCAT, IOTC and SPC, a global Expert Consultation on Implications of the Precautionary Approach for Tuna Biological and Technological Research in Thailand (FAO, 2001). FAO is involved in the consideration of many other global issues involving tuna and tuna-like species. For example, at present, executing a technical, multi-disciplinary Trust Fund Project (GCP/INT/851/JPN) on the Management of Tuna Fishing Capacity: Conservation and Socio-economics. The Technical Advisory Committee for the Project is composed of experts affiliated with CCSBT, FFA, IATTC, ICCAT, INFOFISH (http://www. infofish.org/), IOTC, SPC and international associations of tuna longliners and purse seiners. The Project's activities involve global studies and an Expert Consultation on the Management of Tuna Fishing Capacity, Conservation and Socio-economics. Also, FAO collates data on nominal catches of all fish species including tunas and separately, specifically of tunas The first data set for all species is based mostly on official national statistics; it does not enable to distinguish among different fishing gears. The second data set specifically for tunas allows this, being mainly based on statistics of international organizations involved in tuna fisheries research (Carocci and Majlowski, 2001). Both sets can be accessed from the FAO web page. FAO also collates data on the geographical distribution of catches of tunas and billfishes on the global scale. On the basis of these data, paper, CD and Internet versions of an Atlas of Tuna and Billfish Catches have been prepared (Carocci and Majkowski 1996, 1998, 2001). These data as well as information on tuna resources, fisheries and their management are being incorporated into FAO's Fisheries Global Information System (FIGIS). For many tuna fishing fleets, there is insufficient control of their capacity, actual fishing effort and catches. Recently, concerns on a possible over-capacity of tuna fleets have emerged (Joseph, 2003). As a result, FAO formulated and implements a project on the management of tuna fishing capacity. This project is carried out in collaboration with the tuna fishery bodies and arrangements and other international organizations (including those of the tuna fishing industry) involved in tuna fishing, fisheries research and management. Its objectives is (i) to provide necessary technical information and (ii)to identify consider and resolve technical problems associated with the management of tuna fishing capacity on the global scale, taking into account conservation and socio-economic issues. One of the prime global conservation problems for fishery bodies dealing with tuna and tuna-like species is the depletion of stocks of bluefin. But this concern has also been discussed within the context of the Convention on International Trade in Endangered Species of Wild Fauna and Flora (CITES). However, with the exception of bluefin tuna, serious over-fishing has been largely avoided for various reasons, including the high productivity of tuna species and possibly, decreases in fish prices to uneconomical as markets become saturated. Particularly, recently, the global over-production of canned tuna led to drastic reduction of prices of some species for canning. With the fully exploited status of most stocks of tuna and tuna-like species, more concerns related to their conservation and fisheries management are likely to arise. In addition to the concern for bluefin, some stocks of albacore, bigeye, swordfish and some other billfishes merit some close attention. In the case of bigeye, these concerns are caused by significant global increase of purse seine catches of juveniles. Without adequate fisheries management, future catches of some species may decline in the long term due to over-fishing. With the present status of stocks, the catches of principal market tunas should not increase on the global scale in a near future unless future technological developments will allow to increase catches of skipjack without increasing those of bigeye and yellowfin. As mentioned before, there is a potential to significantly increase catches of skipjack in the western and central Pacific and also, to some extent, in the eastern Pacific. However, in these areas, skipjack is taken together with small bigeye and yellowfin and such an increase, at least, for bigeye and possibly, also yellowfin, is not desirable. In general, the multi-species nature of many tuna fisheries makes it difficult to selectively control the fishing mortality because several species are frequently caught together. The overall yield from tuna and tuna-like species depends on the combination of fishing techniques and fishing effort; and the various fishing methods have different effectiveness and selectivity characteristics when targeting various age groups. Improvements in the yield might be achieved in some cases (e.g. albacore and yellowfin in the Atlantic and also in other oceans, bigeye and northern and southern bluefin tuna) by protecting small or immature fish and targeting older age groups. Problems occur with compliance to the present size regulations (e.g. within the framework of ICCAT, especially for Atlantic bluefin in the Mediterranean Sea and in the eastern Atlantic). The intensification of fishing around FADs also raises concerns because such fishing tends to result in large catches of small fish. In the eastern Atlantic, for example, the problem has become so acute that the industry (French and Spanish purse seiners) is placing self-imposed controls on the use of FADs. In general, the protection of fish of small size may not necessarily result in increases in a local yield from an area with intense emigration. In addition, protecting smaller individuals of species with high natural mortality like skipjack may not always give noticeable results from the conservation point of view. Bio-economic interactions among fisheries need to be scientifically addressed for the resolution of fisheries management problems. Co-ordinated effort in this direction was initiated by FAO's Trust Fund Project: “Cooperative Research on Interactions of Pacific Tuna Fisheries” (Shomura, Majkowski and Langi, 1993a, 1993b, and Shomura, Majkowski and Harman, 1995, 1996). At present, with the completion of this project, this effort is continued by regional and national institutions. The magnitude of incidentally caught species (by-catch), their discards as well as catch of small individuals of target species and the status of stocks of the by-catch species have been another area of concern (Alverson et al., 1994; Bailey et al., 1994; Joseph, 1994; Hall, 1996, 1998, IATTC, 1998). Generally, by-catches of tuna fisheries are relatively low. However, they include species of dolphins, turtles, seabirds and sharks, which receive particularly high attention from the international community. In the future, a greater utilization of by-catch species may be expected. Fishing may become more selective through gear modifications and changes in fishing areas and seasons. Also, more research is likely to be undertaken to determine the status of stocks of species incidentally caught. There is already some improvement in the collection of data on by-catch. There are various management measures imposed for tuna fisheries on regional scales, particularly in areas where tuna fishery bodies have been operational for a long time. This is the case in the Atlantic and the Mediterranean Sea (ICCAT) and the eastern tropical Pacific (IATTC). In the case of ICCAT, they include size limits for bigeye, bluefin and yellowfin, fishing effort restrains for yellowfin and bluefin, catch limits for albacore, bigeye and bluefin and restrictions on the use of FADs. Some other measures include seasonal and geographical closures in the Mediterranean Sea. Allen, R.L. 2002. Global tuna resources: limits to growth and sustainability. In S. Subasinghe & Sudari Pawiro, eds. INFOFISH World Tuna Trade Conference (7th: 2002: Kuala Lumpur) Global tuna industry situation and outlook; resources, production & marketing rends and technological issues: proceedings of the Tuna 2002 Kuala Lumpur, 7thINFOFISH World Tuna Trade Conference, 30th May–1 June 2002, Kuala Lumpur, Malaysia.p. 3–12. Kuala Lumpur, INFOFISH. 207p. Alverson, D.L., Freeberg, M.H., Pope, J.G. & Murawski, S.A. 1994. A global assessment of fisheries by-catch and discards. FAO Fisheries Technical Paper, No. 339. Rome, FAO. 233p. Bailey, K., Williams, P.G. & Itano, D. 1994. By-catch and discards in Western Pacific tuna fisheries: a review of SPC data holdings and literature. Oceanic Fisheries Programme, Internal Report No. 28. Nouméa, New Caledonia, South Pacific Commission. 87p. Bartoo, N. 1995. Tuna and billfish summaries of major stocks. Adm.Rep. LJ-87–26 US Dept. of Commerce. Beckett, J.S. (ed). 1998. Proceedings of the ICCAT Tuna Symposium/Actes du Symposium sur le thon organisé par la CICTA/Actas del Simposio CICAA sobre Túnidos. Part 1. Collect.Vol.Sci.Pap.ICCAT/Recl.Doc.Sci.CICTA/Colecc.Doc.Cient.CICAA. Vol.L(1):447p. Carocci, F. & Majkowski, J. 1996. Pacific tunas and billfishes: Atlas of commercial catches. Rome, FAO. 9p., 28 maps. Carocci, F. & Majkowski, J. 1998. Pacific tunas and billfishes: Atlas of commercial catches. Rome, FAO. CD-ROM version. Rome, FAO. Collette, B.B. & Nauen, C.E. 1983. FAO species catalogue. Vol.2. Scombrids of the world. An annotated and illustrated catalogue of tunas, mackerels, bonitos and related species known to date. FAO Fisheries Synopsis (125)Vol. 2:137p. Doulman, D. 1995. Structure and Process of the 1993–1995 United Nations Conference on Straddling Fish Stocks and Highly Migratory Fish Stocks. FAO Fisheries Circular, No. 898. Rome, FAO: 81p. FAO. 1994. Report of the Ad hoc Consultation on the Role of Regional Fishery Agencies in Relation to High Seas Fishery Statistics. La Jolla, California, USA, 13–16 December 1993. FAO Fisheries Report, No. 500. Rome, FAO. 167p. FAO. 1995. Code of Conduct for Responsible Fisheries . Rome, FAO. 41p. FAO. 1996. Precautionary approach to capture fisheries and species introductions. Elaborated by the Technical Consultation on the Precautionary Approach to Capture Fisheries (Including species introductions). Lysekil, Sweden, 6–13 June 1995. FAO Technical Guidelines for Responsible Fisheries. No. 2. Rome, FAO. 54p. FAO. 2001. Research implications of adopting the precautionary approach to management of tuna fisheries. FAO Fisheries Circular, No. 963. Rome, FAO, 74p. Hall, M.A. 1996. On bycatches. Reviews in Fish Biology and Fisheries 6:3 19–352p. Inter-American Tropical Tuna Commission, 8604 La Jolla Shores Drive. La Jolla. California, USA. Hall, M.A. 1998. An Ecological view of the tuna-dolphin problem: impacts and trade-offs. Reviews in Fish Biology and Fisheries 8:1–34p. Inter-American Tropical Tuna Commission, 8604 La Jolla Shores Drive. La Jolla. California, USA. IATTC. 1998. Purse seine bycatch working group 1stmeeting, 8–9 July 1998, La Jolla, California, USA. Joseph, J. 1994. The Tuna-Dolphin Controversy in the Eastern Pacific Ocean: Biological, Economic, and Political Impacts. Inter-American Tropical Tuna Commission, Scripps Institution of Oceanography, La Jolla, California, USA. Ocean Development and International Law, 25: 1–30. Joseph, J. 1998. A review of the Status of World Tuna Resources. Tuna 97 Bangkok. Papers of the 5th World Tuna Trade Conference, 25–27 October 1997. Bangkok, Thailand. Published by INFOFISH, Kuala Lumpur, Malaysia. 8–21p. Joseph, J. 2000. World tuna production: past, present and future. In S. Subasinghe & Sudari Pawiro, eds. Papers of the 6th World Tuna Trade Conference, 25–27 May 2000, Bangkok, Thailand. p. 3–20, Bangkok. INFOFISH, 233p. Joseph, J. 2003. Managing fishing capacity of the world tuna fleet. FAO Fisheries Circular, No. 982. Rome, FAO. 2003. 67p. Klawe, W.L. 1977. What is tuna? Marine Fisheries Review, No. 11. (Vol.39):1–5p. User Service Branch, Environmental Science Information Center, NOAA, Rockville, MD20852. Mahon, R. 1996. Fisheries and research for tunas and tuna-like species in the Western Central Atlantic: implications of the Agreement for the Implementation of the Provisions of the United Nations Convention on the Law of the Sea of 10December 1982 Relating to the Conservation and Management of Straddling Fish Stocks and Highly Migratory Fish Stocks. FAO Fisheries Technical Paper, No. 357. Rome, FAO. 62p. Majkowski, J. 1998. Precautionary Approach and Tuna Research: Perspective from the 1995 UN Agreement. In Cayré, P. & Le Gall, J.-Y., 1998. Le thon: enjeux et stratégies pour l'océan Indien/Tuna prospects and strategies for the Indian Ocean. In Proceedings of the International Tuna Conference 1996, 27–29 November 1996, Maurice. COI/Orstom, Paris, collection Colloques et Séminaires, 433–60p. Marashi, S.H. 1996. Summary Information on the Role of International Fishery and Other Bodies with Regard to the Conservation and Management of Living Resources of the High Seas. FAO Fisheries Circular, No.908. Rome, FAO. 104p. Miyake, P.M. 1998. Stock management measures taken by the International Commission for the Conservation of Atlantic Tunas (ICCAT) in relation to trade measures. WTO Committee on Trade and Environment, Geneva, 23–24 July 1998. 5p. Nakamura, I. 1985. FAO species catalogue. Vol.5. Billfishes of the world. An annotated and illustrated catalogue of marlins, sailfishes, spearfishes and swordfishes known to date. FAO Fisheries Circular, No. 125(5):65p. Shomura, R.S., Majkowski, J. & Harman, R.F. (eds). 1995. Summary Report of the Second FAO Expert Consultation on Interactions of Pacific Tuna Fisheries. Shimizu, Japan, 23/31January 1995. FAO Fisheries Report, No. 520. Rome, FAO. 58p. Shomura, R.S., Majkowski, J. & Harman, R.F. (eds). 1996. Status of interactions of Pacific tuna fisheries in 1995. Proceedings of the second FAO Expert Consultation on Interactions of Pacific Tuna Fisheries. Shimizu, Japan, 23–31January 1995. FAO Fisheries Technical Paper, No. 365. Rome, FAO. 612p. Shomura, R.S., Majkowski, J. & Langi, S. (eds). 1993a. Interactions of Pacific tuna fisheries. Proceedings of the First FAO Expert Consultation on Interactions of Pacific Tuna Fisheries. 3–11 December 1991. Nouméa, New Caledonia. Vol. 1: Summary report and papers on interaction. FAO Fisheries Technical Paper, No. 336, Vol. 1. Rome, FAO. 326p. Fisheries for cephalopods, especially squid, have attracted interest worldwide over the last two decades. Declining catches in many traditional fisheries have led to increased effort to develop the potential of non-traditional species, especially invertebrates such as the cephalopods. Estimates of global squid consumption by higher predators, especially sperm whales suggest that they consume a greater mass of squid than the total world catch of all marine species combined (Voss, 1973; Clarke, 1983). This is interesting, both because of the commercial potential of squid fisheries, and the role they might have in the provision of high quality protein for human consumption (Caddy, 1983; Roper Sweeney and Nauen, 1984). There is also some evidence that squid populations have increased in regions where there has been overfishing of groundfish stocks (Caddy and Rodhouse, 1998). It has been suggested that this is the inevitable response of populations of short-lived, semeleparous (i.e. individuals die after reproduction), ecological opportunists to both the reduction in predation pressure by predatory groundfish and the creation of vacant trophic niches. Squid catches have increased substantially worldwide and this has highlighted the fact that their populations are highly variable. The Illex illecebrosus fishery in the northwest Atlantic which was developed very rapidly by the east Asian squid jigging fleet in the late 1970s and early 1980s, following a decline of Todarodes pacificus in the northwest Pacific, collapsed suddenly and led to a rapid switching of effort to the southwest Atlantic in the early 1980s to target Illex argentinus. Subsequently catches of Todarodes pacificus have continued to fluctuate but the fishery for Illex illecebrosus has never returned to Canadian waters although consistent, but lower, catches are taken off the eastern USA further south. This large scale variability has attracted attention to the likely role of oceanographic variability in driving recruitment processes in squid stocks (O'Dor and Coelho, 1993; Bakun and Csirke, 1998). This short review provides an overview of the current status of the world squid fisheries and considers the life history and biological characteristics of squid in the context of the management of the fisheries. It briefly reviews the role of squid in marine ecosystems, describes the relationship between squid stocks and major oceanographic systems and introduces current research on the role of oceanographic variability in driving recruitment processes in squid populations. Finally it provides a brief analysis of the current status of the world squid fisheries and considers the potential for future development. In 2002, 75 percent of the 2.18 million tonnes of reported world squid catch (FAO, 2002) was identified to species. This included 12 species from two families, the Ommastrephidae and Loliginidae (Table C2.1). Of the remaining 25 percent some 11 percent was unidentified (“not elsewhere included” or nei) common squids (loliginids), and another 14 percent was included in a more general unidentified squid category. The fact that about a quarter of the world squid catch was unidentified is a reflection of the fact that there is a major artisanal and small-scale inshore element to the world squid fishing fleet and that large volumes are caught in tropical and subtropical regions where species diversity is high especially among the loliginid squids. In these areas the taxonomy of the squid fauna generally is poorly understood. Two species of ommastrephid squid, Illex argentinus and Todarodes pacificus, comprized 46 percent of the world squid catch and the identified ommastrephids taken together contribute about 70 percent of the catch making this the single most important group. Loligo gahi has consistently been the most important loliginid squid in the world catch over the decade up to 2002. In 2002 about 225000 tonnes of unidentified cephalopods were also caught and an unknown, but probably substantial, proportion of this would have been squid. The ommastrephid squid are almost exclusively caught using jigs (lures) armed with barbless hooks which are fished in series on lines using automatic machines (Suzuki, 1990). The squid are attracted towards the jigs at night with incandescent, metal halide lamps suspended on cables above the deck of the vessel. Small coastal vessels may use a single lamp while the large industrial vessels operate with 150 or more lamps which are typically 2 kW each. The lamps mostly emit white light but small numbers of green lamps are often interspersed in the arrays (Inada and Ogura, 1988). Some industrial vessels will also operate one or two underwater lamps which are raised through the water column, and dimmed, as the squid are attracted towards the vessel. Jiggers typically deploy a large parachute drogue to prevent drifting downwind while fishing, thus enabling the jig lines to operate close to the vertical. The major fisheries for loliginids mostly use trawls which operate during daytime when the squid are concentrated near the seabed. Conventional otter trawls fish on the bottom but over rough ground pelagic trawls may be fished just off the seabed to avoid fouling the gear. Trawls designed for squid fishing generally have a higher head rope than would be usual for finfish. Outside the major fisheries a wide variety of gear including jigs, traps, nets etc are used to catch loliginid squid (e.g. Chotiyaputa, 1993). Table C2.1. Summary of the world squid catch in 2002 (FAO 2003). Distribution of the major squid stocks is shown in Figure C2.1. 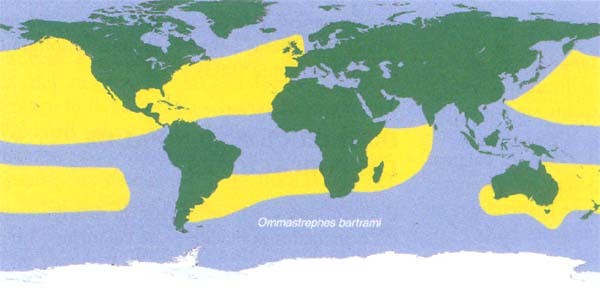 The ommastrephids are caught offshore over continental shelves and off-shelf over the deep ocean. They all come close to the surface at night but may migrate down to depths of 1000m during the day (Yatsu et al., 1999). The light fisheries for members of this squid family can be visualized through their light emissions by orbiting satellites of the US Defense Meteorological Satellite Programme (http://dmsp.ngdc.noaa.gov/dmsp.html) (Rodhouse et al., 2001) (Figure C2.2). Todarodes pacificus is distributed at the margins of the northwest Pacific from 20° N to 60°N and the major fisheries are around Japan, especially in the southern part of the Sea of Japan and in the Tsushima Strait (Figure C2.2a). I. argentinus is a southwest Atlantic species extending from about 30°S to 52°S. 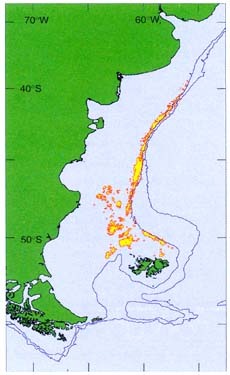 The fishery is mostly concentrated along the edge of the Patagonian Shelf but extends over the shelf to the north of the Falkland Islands (Malvinas) (Figure C2.2b). Illex illecebrosus occurs in the north Atlantic from 25°N off Florida to about 60° N. Its habitat is similar to that of I. argentinus being concentrated near the shelf edge but extending over the shelf and into deeper water to a depth of about 1000m. Since the early 1980s, when the East Asian jig fishery for the species off Canada collapsed, it has largely been exploited by trawlers off the US coast so the fishery cannot be visualized through their light emissions by satellite. Nototodarus sloanii and Martialia hyadesi are southern hemisphere species, the former is exploited in sub-Antarctic waters over the shelf of the south island of New Zealand (Figure C2.2c) and gives way to the smaller stock of N. gouldi in the subtropical waters around the north island. M. hyadesi has a circumpolar distribution in the Southern Ocean but is only exploited commercially in the Southwest Atlantic sector by the fleet primarily targeting Illex argentinus . Ommastrephes bartrami is an epipelagic species which occurs over the deep ocean in the Atlantic, Pacific and Indian Oceans. In all three oceans it is absent from equatorial waters and extends from the subtropics to temperate waters in the northern and southern hemispheres. Despite its wide distribution it is only exploited commercially in the northwest Pacific off north east Japan (Figure C2.1b). Dosidicus gigas is distributed in the eastern Pacific from 35°N off California to southern Chile extending westwards furthest in the tropics to about 120°W. It is largely an off-shelf species. The major fisheries for D.gigas are off Peru (Figure C2.2d) and in the vicinity of the Costa Rica Dome off Central America. Todarodes sagittatus is an eastern Atlantic species occurring from the Arctic off northern Norway to about 13°S and westwards to approximately 40° W. It is caught as a by-catch of trawlers although in the early 1980s it occurred at sufficient densities in Norway to generate a short-lived, targeted fishery (Wiborg, 1986). The most important loliginid squid identified in the world catch is Loligo gahi which is distributed in coastal and shelf waters around the coast of South America from southern Peru to northern Argentina. Most of the catch is caught in waters to the south and east of the Falkland Islands (Malvinas) by trawlers. 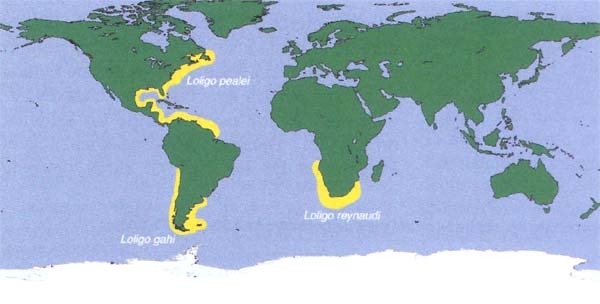 Loligo pealei is a western Atlantic species in coastal and shelf waters along the eastern seaboard of the USA, Central and South America from 50°N to 5°N which is also caught by trawlers. Loligo reynaudi, as recorded by FAO, is a southern African squid, the distribution of which is poorly known. Augustyn and Grant (1988) have shown that on the basis of morphology, meristics and allozymes, L. reynaudi and L. vulgaris are, in fact, two sub-species (L. vulgaris reynaudi and L.vulgaris vulgaris ). The fishery for L. vulgaris reynaudi is largely pursued by small jigging vessels (ski boats). In addition to the identified species some 226 000t of unidentified loliginids were reported to FAO in 2002, most of which are from east Asia and the west coast of the USA. The species grouping includes Loligo opalescens in California which is fished mostly around the Channel Islands and Monterey Bay by lampara vessels; L. chinensis on the shelves of the China Sea (Dong, 1991) caught by large fleets of light fishing vessels detected by DMSP imagery (Rodhouse et al., 2001) and; L.chinensis and L. duvauceli in the Sunda-Arafura Shelf region which are caught by jigging and a variety of other techniques (Chotiyaputa, 1993). A further 311 000t of squid not identified to family level was also reported to FAO in 2002. These are mostly caught in East Asia (Rodhouse et al. 2001) and would include ommastrephids and loliginids but also some members of other families such as the Thysanoteuthidae (Thysanoteuthis rhombus) and Enoploteuthidae (Watasenia scinitillans ). The squids, in common with the other coleoid cephalopods, are semelparous and generally short-lived (Calow, 1987). Most commercially exploited species have a life span of approximately one year at the end of which there is a single spawning event followed by death. The coleoids appear to have evolved from their molluscan ancestors through the process of progenesis which is reflected in the attainment of full sexual maturity while still retaining juvenile characteristics, at least in some respects (Rodhouse, 1998a). In the coleoids, the juvenile characteristics that are still present at full sexual maturity are features of their physiological energetics, and are not morphological. The short life span and semelparous lifestyle of the squid and other coleoid cephalopods distinguishes them from most, if not all, the fish species that are exploited commercially (Pauly, 1994). These characteristics present particular problems for the management of the fisheries. The essence of the problem is that once the spawners of one generation have reproduced and died it is almost impossible to assess the potential recruitment strength and stock size of the next generation. A meaningful quota cannot therefore be set until the next generation recruits into the fishery. For this reason Caddy (1983) and Csirke (1986) recommended that squid and other cephalopod fisheries should be managed by effort limitation and assessed in real-time. This approach has been adopted and refined in the case of the fisheries for Illex argentinus and Loligo gahi in the areas around the Falkland Islands (Malvinas) (Beddington et al., 1990, Rosenberg et al., 1990, Basson et al., 1996). In this fishery, effort is set on the basis of historical information on stock size then, once the fishery is opened, the stock is assessed using a Leslie-Delury depletion analysis and the fishery is closed once it is estimated that the remaining biomass corresponds to the target spawning escapement. When management of the fishery first started in 1987 the target escapement was set at 40 percent of the numbers of squid recruited into the fishery. More recently the escapement target has been an absolute value so as to stabilize the size of the spawning population in the face of variable recruitment. Collaborative pre-recruitment surveys are now also carried out to improve the initial assessment prior to the start of fishing when effort is being set. The squids are versatile in their ability to capture, subdue and consume a wide variety of prey and they feed voraciously to maintain the active life-style associated with fast growth, short life span and semelparity (Rodhouse and Nigmatullin, 1996). Their prehensile arms and tentacles together with their highly evolved sensory system are adaptations for a broad trophic niche. Many species, especially among the ommastrephids, make large scale migrations enabling them to take advantage of spatial and temporal variations of marine production systems and prey populations. Most juvenile squid prey on small crustaceans and as they grow they gradually switch to fish and other cephalopods. Many, if not all, species are cannibalistic, generally feeding on other members of the same cohort, and this has been suggested to be particularly important during large scale migrations when food resources are scarce (O'Dor and Wells, 1987). Where squid prey on commercially exploited stocks of other species their impact on recruitment to the fisheries is potentially substantial. The prey of squid caught by the global light fishery, mostly over the world's continental shelves, has recently been reviewed by Rodhouse et al., (2001). The data are not very detailed but confirm the general trend of predation on crustaceans during early life and shift to fish and cephalopods as individuals grow. The oceanic ommastrephids, such as Ommastrephes bartrami, currently exploited by light fisheries in the northwest Pacific and Dosidicus gigas off Peru, primarily feed on mesopelagic fishes, particularly myctophids. The largely unexploited stocks of oceanic ommastrephids elsewhere in the world's oceans are also known to consume myctophids (Rodhouse and Nigmatullin, 1996). Large stocks of myctophids are present in some areas, particularly the Indian Ocean (northern Arabian Sea) (Shotton, 1997) and in sub-Antarctic waters of the south Atlantic. In these areas they are preyed on by the ommastrephids Sthenoteuthis oualaniensis and Martialia hyadesi respectively. However, so little is known about the ecology of these oceanic food chains that any future fisheries for these squid species, or their prey, should be developed with caution. Squid are also important prey for numerous higher predators: fish, seabirds, seals and whales (Clarke, 1996). In areas where groundfish stocks have been depleted by fishing there is evidence in FAO catch data suggesting that populations of short-lived cephalopods might have increased contributing to their increased predominance in fish landings. It has been suggested that this increased squid abundance and the observed rise in cephalopod catches has been, at least partially the response to the relaxation in predation pressure (Caddy and Rodhouse, 1998). Seabirds probably have a smaller impact on squid stocks than the marine mammals but, taken together, global estimates of consumption of squid and other cephalopods by higher predators far exceed global or regional catches by the commercial fisheries (Voss, 1973; Clarke, 1983; Croxall et al., 1985). There are, however, questions about possible bias in these estimates caused by the dynamic nature of cephalopod populations, and hence bias on estimation on standing stock biomass, and the problem of estimating consumption when retention time of remains in predator's gut contents is not well known (Rodhouse et al., 2001). The large exploited stocks of ommastrephids are mostly associated with the high velocity western boundary current systems of the Atlantic and Pacific Oceans (O'Dor and Coelho, 1993). 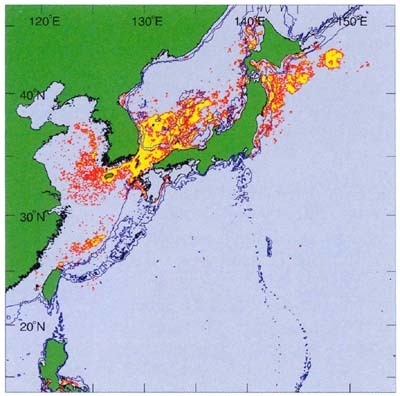 Todarodes pacificus, which for many years has dominated the global ommastrephid squid catch, is distributed in the Kuroshio Current, the western boundary current of the North West Pacific. Its range extends from 20°N to 60°N (Figure C2.1d) but the fishery is concentrated at the latitude of the confluence of the cold, southwards flowing waters of the Oyashio system and the warm, northwards flowing Kuroshio between 35°N to 40°N, east and west of Japan (Figure C2.2a). Similarly Illex illecebrosus in the north Atlantic is associated with the warm, northwards flowing Gulf Stream from 25°N to about 60°N (Figure C2.1a), the western boundary current of the northwest Atlantic. In the late 1970s and early 1980s, when I. illecebrosus catches by East Asian squid jiggers peaked, the largest catches were taken off Nova Scotia and Newfoundland in the region of the confluence with the cold, southwards flowing Labrador Current. In the south Atlantic, Illex argentinus follows the same pattern, being distributed in the southwards flowing Brazil Current, the western boundary current of the south west Atlantic and the opposing, cold northerly flowing Falkands (Malvinas) Current (Haimovici et al. 1998). Fishing here is concentrated in relatively cool waters to the north of the Falkland Islands (Malvinas) (Figure C2.2a). Catches are greatest in the vicinity of temperature gradients, probably associated with thermal fronts in the wake of the Falkland Islands (Malvinas) (Waluda et al., 2001a). Here the cool waters of the Falkland (Malvinas) Current, a branching loop of the Antarctic Circumpolar Current, meet the warmer water over the Patagonian Shelf. Two other southern hemisphere species, Nototodarus sloani and Martialia hyadesi are also associated with high velocity, cool waters - in these cases the current being the Antarctic Circumpolar Current at low latitudes in the vicinity of the sub-Antarctic Front (Figure C2.1d). The largest ommastrephid species, Dosidicus gigas, is an exception to the general rule of association with high velocity western boundary systems, occurring in the weak northwards flow of the cool Peru (Humboldt) Current in the south eastern Pacific (Figure C2.1a). 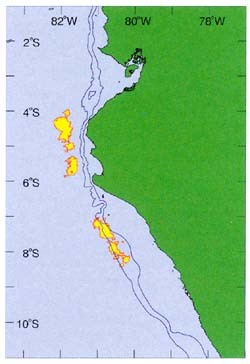 Although this is the highly productive upwelling system that supports the large but variable anchoveta (Engraulis ringens) fishery off Peru, D. gigas appears to avoid areas of highest primary production, (Nesis 1983) and preys largely on mesopelgic fishes off the edge of the narrow continental shelf of South America. The loliginidae are a more diverse family than the ommastrephidae. Roper et al. (1984) list 7 genera and thirty one loliginid species of interest to fisheries. They occur in shelf waters from close inshore to the shelf edge in all regions of the world's oceans apart from the Arctic and Antarctic. They do not appear to make large scale migrations and are not dependent on the large scale current systems in the way that the ommastrephids are. They generally occupy productive coastal waters and because of the presence of a corneal membrane covering the eye (hence suborder Myopsida) they are able to tolerate higher sediment loads than the ommastrephidae. 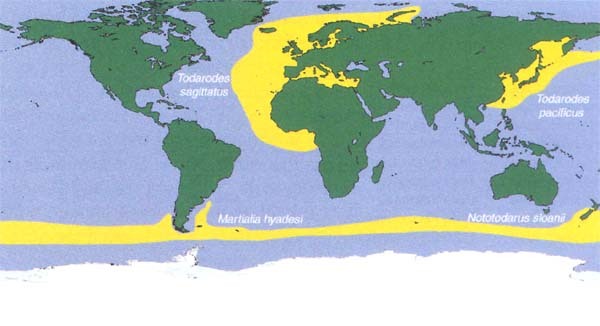 The major fisheries for loliginids are found in a diverse range of habitats including the coastal upwelling system of the narrow Californian Shelf, the productive cool waters of the Patagonian Shelf around the Falkland Islands (Malvinas) and the Sunda-Arafura Shelves of Southeast Asia subject to the reversing wind and current system of the annual monsoon. Given that the cephalopods are semelparous, short-lived, ecological opportunists, their populations can be expected to be highly variable with recruitment being driven by variability in the physical and ecological environment. It has been suggested that population size in several cephalopod stocks has probably responded in recent years to changes in the biological environment caused by overexploitation of groundfish stocks (Caddy and Rodhouse, 1998). Furthermore Bakun and Csirke (1998) have developed a conceptual model of how variability in the oceanic environment may drive interannual variability, especially in stocks of the ommastrephid species that depend on the major western boundary current systems. They hypothesize that recruitment variability may be driven by: 1) wind effects, with onshore, wind directed Ekman transport being favourable to both onshore transport of surface dwelling larvae and offshore migration of pre-adults in the sub-pycnocline layers; 2) fluctuations in prey abundance; 3) potential “match-mismatch” effects (Cushing, 1975); 4) variations in predation pressure and 5) disease epidemics. Recent research in the South Atlantic using remotely sensed sea surface temperature (SST) data (Waluda et al., 2001b) has shown that about 55 percent of the variability in recruitment strength in the Falkland Islands (Malvinas) Illex argentinus fishery can be explained by changes in the area of surface waters of putative optimum temperature for larval development on the spawning grounds during the spawning season prior to recruitment. The spawning grounds are near the confluence of the Brazil Current and the Falkland (Malvinas) Current off the shelf edge at the latitude of the mouth of the Plate River (Rio del Plata). These conditions are associated with a decreased area of ocean surface characterized by steep temperature gradients. Sea surface temperatures in the South Atlantic show teleconnections with ENSO events in the Pacific and it is reasonable to conclude that variability in the Illex argentinus population is linked indirectly to the ENSO cycle (Waluda et al., 1999). Similarly, it has been shown that variability in stock size in the Todarodes pacificus fishery in the Sea of Japan is driven by changes in optimum SST for larval development (Sakurai etal., 2000). This variability occurs on decadal scales and is apparently linked to decadal climate changes in the north Pacific basin. Among the loliginids variability in stock size of the squid Loligo vulgaris vulgaris in the English Channel has also been correlated with SST variability (Robin and Denis, 1999). In South Africa the Loligo vulgaris reynaudii stock is subject to variability apparently driven by storm events during the spawning season which reduce underwater visibility on the spawning grounds and have negative effect on breeding success (Roberts and Sauer 1994, Roberts 1998). Squid have excellent eyesight and have ritualized mating behaviour dependent on being able to read the “body language” of potential mates (Sauer et al., 1997). When poor visibility prevents the essential mating rituals the spawning success of the population is apparently reduced. Understanding of the physical forces driving variability in squid populations is at an early stage at the present. But, short lived species, such as squid, provide excellent subjects for analysis of variable recruitment processes because of the semelparous life cycle and hence rapid population response to environmental signals. Their populations are relatively labile compared to the high inertia populations of long-lived fish which are damped by the presence of several year classes living contemporaneously. In the same way that squid populations have been shown to respond to global environmental changes in marine systems driven by overexploitation of fish stocks (Caddy and Rodhouse, 1998), they may also be sensitive biological indicators of global environmental changes in the physical environment of the oceans. 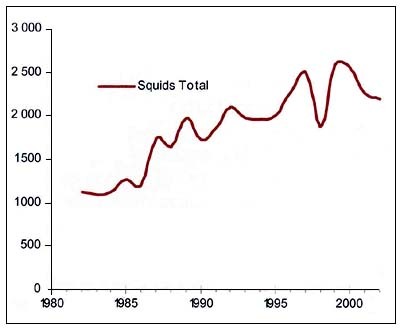 In the decades 1982–2002 squid catches have ranged between 1.1 and 2.6 million tonnes per year (Figure C2.3). 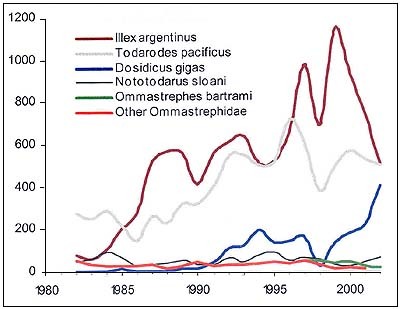 Catches of identified squid are dominated by ommastrephids, and mostly by Illex argentinus and Todarodes pacificus, but between 1991 and 2002 Dosidicus gigas made a substantial contribution (Figure C2.4) reaching about 406 356t in 2002. Among the loliginids Loligo spp. have consistently contributed nearly 230,000 tonnes per year. 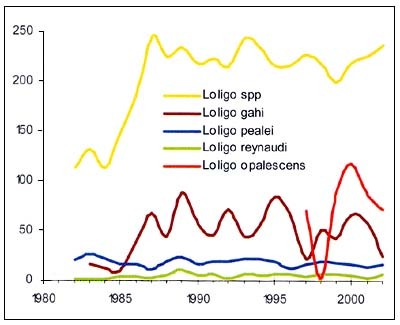 From 1985 to 1997 Loligo gahi has dominated the identified catch by a considerable margin (Figure C2.5), but in most years since catches of L.opalescens have been consistently higher than of L.gahi . Records of unidentified squid have declined by a factor of 2.5 from 1989 to 1993, stabilizing at about 300 000t since. (Figure C2.6). Although there has been considerable variability in catches of all species, and in the total squid catch, over the last decade there does not appear to be any consistent trend. It seems likely that the species currently exploited, which have continental shelf or near shelf distributions, are all fully exploited, with the exception of Ommastrephes bartrami, and variations in catch rate are driven by environmental variability (see above). On the other hand there is evidence that stocks of the oceanic squids could make a substantial contribution to increased catches of cephalopods. Ommastrephes bartrami is only exploited systematically in the northwest Pacific although its distribution is global in the subtropical and temperate regions. Other ommastrephids, particularly Sthenoteuthis oualaniensis in the Indo-Pacific (Yatsu etal., 1998) and Todarodes filippovae and Martialia hyadesi in the Southern Ocean (Rodhouse, 1997, 1998b) have also been identified as having potential for supporting substantial fisheries. Squid from other families also have potential which is only just being developed. The gonatid Berryteuthis magister in high latitude north Pacific waters and Thysanoteuthis rhombus in tropical/subtropical waters of all the oceans are lightly exploited and do not appear in FAO data but could probably stand increases in exploitation rate and both have desirable qualities for human consumption (Nesis, 1998; Yatsu, 1998). Estimates of cephalopod predation by global populations of higher predators, especially sperm whales, have led to very high estimates of the potential for fisheries. Data from the Soviet years of deep ocean resource exploration based on sampling by nets provide more modest estimates of fishery potential but still suggest that cephalopods, especially squid, could support catches of up to 5–10 million tonnes per year (Nigmatullin, 1990). Increases of this order would involve exploiting families such as the Histioteuthidae and Octopoteuthidae for which no markets currently exist but which may be palatable for human consumption. Exploiting the deep ocean squid, which themselves probably feed in the poorly understood mesopelagic community, would pose serious management problems given the current poor state of knowledge of these ecosystems and the fact that these systems largely lie outside the EEZs of the nation states. As well as being the subject of myth and legend giant squid appear from time to time on the ocean surface, stranded on the shore or caught by accident. The largest known squids belong to the genus Architeuthis, and theyoccur throughout the world's oceans except perhaps in the polar regions. There may be several species but the taxonomy is poorly known. Although accounts of truly enormous squid exist there are few well documented records of specimens of Architeuthis exceeding about 2 m mantle length. As well as Architeuthis there are also a number of other squid species that reach large sizes (>1 m mantle length) including the Antarctic cranchiid, Mesonychoteuthis hamiltoni, the Antarctic onychoteuthid Kondakovia longimana, the Pacific onychoteuthid Moroteuthis robusta and the widespread Taningia danae . The ommastrephid Dosidicus gigas, dealt with elsewhere in this chapter, grows to about 1 m mantle length. Apart from D. gigas, these very large squids are unlikely to ever be of interest to fisheries. They are too rare to be exploited and some species, notably Architeuthis, are ammoniacal and hence distasteful to the human palate. There are however ways in which they may interact with fisheries. Several Architeuthis have been caught over the years in the orange roughy fishery off New Zealand and there is also some evidence that growing numbers are becoming stranded on shores in the region. Could it be that increasing numbers of giant squid are being discarded from trawlers and, because they are ammoniacal and hence buoyant, they are floating ashore? Elsewhere the very large squid Mesonychteuthis hamiltoni is known to be a common species in the diet of sperm whales at South Georgia (Clarke, 1980) and so the species is presumably present in substantial numbers in the deep waters off the shelf in this part of the Scotia Sea. The area is now the location of a deepwater fishery for the Patagonian toothfish, Dissostichus eleginoides . Is Dissostichus an important prey species for Mesonychteuthis ? The armament of hooks on the arms and tentacles certainly indicate that this squid is adapted for preying on large prey of some sort. Because the world squid stocks currently being fished over the continental shelves and near-shelf regions of the oceans are likely to be close to fully exploited, variability in recruitment strength and abundance is probably largely environmentally driven. It is questionable to what extent fishing effort might drive changes in recruitment and in this respect the squids could perhaps be compared with insect plague pests such as the desert locust. Populations of these species are difficult to control and respond to environmental variability and change, on scales generally far greater than can be achieved by human intervention (Skaf et al., 1990; Zick, 1990). Environmentally driven variability in abundance has caused large shifts in effort between the major ommastrephid stocks which do not seem to cycle synchronously. When catches have been generally low worldwide this has led to attempts to locate new fisheries such as in the mid 1990s when Illex argentinus abundance was particularly low on the Patagonian Shelf and exploratory fishing for Martialia hyadesi took place in CCAMLR waters south of the Antarctic Polar Front. This led to recommendations for precautionary measures to protect dependent species of higher predators (Rodhouse, 1997). Future changes in abundance of the currently exploited species are likely to increase the likelihood of development of new fisheries and extend exploitation offshore of the shelf regions. This will create several new challenges for management, both for ecological and socioeconomic reasons. The dynamics of mesopelagic systems are poorly understood and squid may be keystone species in some areas such as the Antarctic Polar Frontal Zone (Rodhouse and White, 1995) and possibly elsewhere such as the Indian Ocean. Some populations may lie entirely outside EEZs of nation states. Although there are unexploited stocks and the variability in abundance of exploited stocks may not be primarily driven by the effects of exploitation there is every reason to apply strict precautionary principles to all fisheries given their potential for production of high quality protein for human consumption and also the role of squid populations in marine food webs. Squid stocks present new challenges for fisheries management but the apparent relationship between variability in abundance and environmental variability means that these short-lived species may prove to be more predictable and amenable to fishery forecasting than the longer lived species exploited by the traditional fisheries. Bakun, A. & Csirke, J. 1998. Environmental processes and recruitment variability. In: Rodhouse, P.G., Dawe, E.G. and O'Dor, R.K. (eds.). Squid recruitment dynamics. The genus Illex as a model. The commercial Illex species. Influences on variability. FAO Fisheries Technical Paper, No. 376. Rome, FAO, 273 pp. Basson, M., Beddington, J.R., Crombie, J.A., Hoolden, S.J., Purchase, L.V. & Tingley, G.A. 1996. Assessment and management of annual squid stocks: the Illex argentinus fishery as an example. Fish. Res., 28: 3–29. Beddington, J.R., Rosenberg, A.A., Crombie, J.A. & Kirkwood, G.P. 1990. Stock assessment and the provision of management advice for the short fin squid fishery in Falkland Islands waters. Fish. Res., 8: 351–165. Caddy, J.F. 1983. The cephalopods: factors relevant to their population dynamics and to the assessment of stocks. p. 416–452. In “Advances in assessment of world cephalopod resources” (Caddy, J.F. ed. ), FAO Fisheries Technical Paper, No. 231, 452p. Caddy, J.F. & Rodhouse, P.G. 1998. Do recent trends in cephalopod and groundfish landings indicate widespread ecological change in global fisheries. Rev. fish Biol. Fish . 8, 431–444. Calow, P. 1987. Fact and theory - an overview. In: Boyle, P. R. (ed) Cephalopod life cycles, Vol.2. Academic Press, London, p. 351–365. Chotiyaputta, C. 1993. Cephalopod resources of Thailand. In T. Okutani, R.K. O'Dor & T.Kubodera (eds.) Recent Advances in Cephalopod Fishery Biology, pp 71–80. Tokai University Press, Tokyo. Clarke, M.R. 1980. Cephalopods in the diet of sperm whales in the southern hemisphere and their bearing on sperm whale biology. Discovery Reports 37, 1–324. Clarke, M.R. 1983. Cephalopod biomass - estimation from predation. Memoirs of the National Museum of Victoria 44, 95–107. Clarke, M.R. 1996. The role of cephalopods in the world's oceans. Philosophical Transactions of the Royal Society of London B 351, 977–1112. Croxall, J.P., Prince, P.A. & Rickets, C. 1985. Relationships between prey life-cycles and the extent, nature and timing of seal and seabird predation in the Scotia Sea. In W.R. Condy, P.R. Seigfried and R.M. Laws, (eds. ), Antarctic nutrient cycles and food webs, Springer, Berlin. Csirke, J. 1986. The Patagonian fishery resources and the offshore fisheries in the South-west Atlantic. FAO Fisheries Technical Paper, No.286: 75p. Cushing, D.H. 1975. Marine ecology and fisheries. London, Cambridge University Press, 271 pp. Dong, Z. 1991. Biology of the Economic Species of Cephalopods in the World Oceans . Shandong Science and Technology Press, Jinan, China, 279p. (In Chinese). FAO. 2003. Capture production 1950–2001. Available in Fishstat Plus (Universal software for fishery statistical time series) version 2.30 http://www.fao.org/fi/statist/fisoft/fishplus.asp and CD-ROM of March 2003 FAO, Rome. Haimovici, M., Brunetti, N.E., Rodhouse, P.G., Csirke, J. & Leta, R.H. 1998. Illex argentinus. In Rodhouse, P.G., Dawe, E.G and O'Dor, R.K. (eds. ), Squid Recruitment Dynamics - the Genus Illex as a Model, the Commercial Illex species and Influences on Variability, FAO Fisheries Technical Paper, No. 376, pp 27–58. Rome, FAO. Inada, H. & Ogura, M. 1988. Historical changes of fishing light and its operation in squid jigging fisheries. The report of the Tokyo University of Fisheries 24, 189–207. Nesis, K.N. 1983. Dosidicus gigas. In: Boyle, P.R., (Ed. ), Cephalopod Life Cycles . Academic Press, London, Vol. 1, pp. 215–231. Nesis, K.N. 1998. The gonatid squid Berryteuthis magister (Berry, 1913): distribution, biology, ecological connections and fisheries. Large pelagic squids. Japan Marine Fishery Resources Research Center, Tokyo, 233–249. Nigmatullin, Ch.M. 1990. Resources and fishery perspectives of nektonic epipelagic squids of the world ocean. In: All-Union Conference “Reserve food and biological resources of the open ocean and seas of the USSR (April 1990, Kaliningrad). Abstracts of reports (Alexeyev, A.P. ed.). Moscow, pp. 11–12 (in Russian). O'Dor, R.K. 1983. Illex illecebrosus. In P.R. Boyle, ed. Cephalopod life cycles, Vol. I, p. 175–199. London, Academic Press. O'Dor, R.K. & Wells, M.J. 1987. Energy and nutrient flow in cephalopods. In P.R. Boyle, ed. Cephalopod life cycles, Vol. II, p. 109–133. London, Academic Press. O'Dor, R.K. & Coelho, M.L. 1993. Big squid, big currents and big fisheries. In T. Okutani, R.K. O'Dor and T. Kubodera, eds. Recent advances in cephalopod fisheries biology, p. 385–369. Tokyo, Tokai University Press. Pauly, D. 1994. Why Squid, though not fish, may be better understood by pretending they are. S. Afr. J. mar. Sci. 20: 47–58. Roberts, M.J. 1998. The Influence of the environment on Chokka Squid Loligo vulgaris reynaudii Spawning Aggregations: Steps towards a quantified model. S. Afr.J.Mar.Sci . 20: 267–284. Roberts, M.J. & Sauer, W.H.H. 1994. Environment: the key to understanding the South African chokka squid (Loligo Vulgaris Reynaudii) life cycle and fishery? Antarctic Sci. 6 (2): 249–258. Robin, J.P., & Denis, V. 1999. Squid stock fluctuations and water temperature: temporal analysis of English Channel Loliginidae. Journal of Applied Ecology. 1999. 36. 101–110. Rodhouse P.G. 1997. Precautionary measures for a new Martialia hyadesi (Cephalopoda, Ommastrephidae) fishery in the Scotia Sea: an ecological approach. CCAMLR Science 4: 125–139. Rodhouse, P.G. 1998a. Physiological progenesis in cephalopod molluscs. Biol. Bull . 195: 17–20. Rodhouse, P.G. 1998b. Todarodes filippovae in the Southern Ocean: an appraisal for exploitation and management. Large pelagic squids. Japan Marine Fishery Resources Research Center, Tokyo, 207–215. Rodhouse, P.G., Elvidge, C.D. & Trathan, P.N. 2001. Remote sensing of the global light fishing fleet: an analysis of interactions with oceanography, other fisheries and predators. Adv. Mar. Biol., 39, 261–303. Rodhouse, P.G. & Nigmatullin, Ch.M. 1996. Role as consumers In : M.R. Clarke, ed., The role of cephalopods in the world's oceans . Philosophical Transactions of the Royal Society of London 351, 1003–1022. Rodhouse, P.G. & White, M.G. 1995. Cephalopods occupy the ecological niche of epipelagic fish in the Antarctic Polar Frontal Zone. Biological Bulletin 189, 77–80. Roper, C.F.E., Sweeney, M.J. & Nauen, C.E. 1984. FAO species catalogue. Vol. 3. Cephalopods of the world. An annotated and illustrated catalogue of species of interest to fisheries. FAO Fisheries Synopsis, 125(3): 277p. Rosenberg, A. A., Kirkwood, G.P., Crombie, J.A. & Beddington, J.R. 1990. The assessment of stocks of annual squid species. Fish. Res., 8, 335–349. Sakurai, Y., Kiyofuji, H., Saitoh, S., Goto, T. & Hiyama, Y. 2000. Changes in inferred spawning arteas of Todarodes pacificus (Cephalopoda: Ommastrephidae) due to changing environmental conditions. ICES J. mar. Sci., 57: 24–30. Sauer, W.H.H., Roberts, M.J., Lipinski, M.R., Smale, M.J., Hanlon, R.T., Webber, D.M. & O'Dor, R.K. 1997. Choreography of the squid's ‘nuptual dance’. Biol. Bull., 192, 203–207. Shotton , R. 1997. Lanternfishes: a fishery in the Northern Arabian sea. In: FAO Marine Resources Service, Fishery Resources Division. Review of the state of world fishery resources: marine fisheries. FAO Fisheries Circular, No. 920, Rome, FAO, 173. Skaf, R., Popov, G.B. & Roffey, J. 1990. The Desert Locust: an international challenge. Phil. Trans. R. Soc. London. B. 1990. 328 525–538. Suzuki, T. 1990. Japanese common squid Todarodes pacificus Steenstrup. Marine Behaviour and Physiology 18, 73–109. Voss, G.L. 1973. Cephalopod resources of the world. FAO Fisheries Circular, No. 49, 75pp. Waluda, C.M., Trathan, P.N. and Rodhouse, P.G. 1999. Influence of oceanographic variability on recruitment in the genus Illex argentinus (Cephalopoda: Ommastrephidae) fishery in the South Atlantic. Mar. Ecol. Prog. Ser., 183, 159–167. Waluda, C.M., Rodhouse, P.G., Trathan, P.N. & Pierce, G.J. 2001a. Remotely sensed mesoscale oceanography and the distribution of Illex argentinus : towards operational squid fisheries oceanography in the South Atlantic. Fisheries Oceanography 10: 207–216. Waluda, C. M., Rodhouse, P. G., Podestá, G. P., Trathan, P. N. & Pierce, G. P. 2001b. Oceanography of Illex argentinus (Cephalopoda: Ommastrephidae) hatching grounds and influences on recruitment variability. Mar. Biol . 139: 671–679. Wiborg, K.F. 1986. The Norwegian Squid Fishery in 1985. Fiskets Grang, 36, 593–596. Yatsu, A., Kouichi, K., Futoshi, K., Kan-ichi, Y. & Keisuke, M. 1998. Distribution and biology of Sthenotehthis oualaniensis in the Indian Ocean - preliminary results from the research cruise of the R/V Shoyo-Maru in 1995. In T. Okutani ed., Large Pelagic Squid, pp 145–153. Japan Marine Fishery Resources Center, Tokyo. Yatsu, A., Yamanaka, R. & Yamashiro, C. 1999. Tracking experiments of the jumbo flying squid, Dosidicus gigas, with an ultrasonic telemetry system in the eastern Pacific Ocean. Bulletin of the National Research Institute of Far Seas Fisheries, 36, 55–60. Zick, C. 1990 A Meteosat motion picture of a weather situation relevant to locust reports. Phil. Trans. R. Soc. London. B. 328, 678–688.